In many ways, the history of the North Eastern Railway (NER) starts back in the 18th or even 17th century with the intense development of coal mining in north eastern England. Colliery developments led to the early adoption of wagonways. At the time, these were probably the largest and most extensive wagonways in the world, and included such pioneering structures as the surviving Causey Arch. The demand for coal continued, and it is of no surprise that the first locomotive hauled public railway was in the region. The pioneering Stockton & Darlington Railway (S&D) opened in 1825 to haul coal from collieries in the Shildon area (near Darlington) for loading on to ships at Stockton. This railway proved to be a great success and became an example for the various railway proposals over the coming years. It also grew to become one of the largest railways in the north east. The NER itself was formed almost thirty years later on 31st July 1854, by the amalgamation of the York Newcastle & Berwick Railway; the York & North Midland Railway; the Malton & Driffield Railway; and the Leeds Northern Railway. The two York railways were amongst the remnants of George Hudson's empire. The York & North Midland was very much Hudson's power base, and the York Newcastle & Berwick Railways was a part of his plans for a railway to Scotland. Despite Hudson's problems, much of this plan had been completed. Newcastle Central Station and Berwick's famous Royal Border Bridge had both been triumphantly opened in 1850 by Queen Victoria, completing the north section of what would become known as the East Coast Main Line. Over the next nine years, the NER and S&D came to dominate the north east. Both would grow by absorbing smaller railways or building new lines. A notable NER acquisition was that of the Newcastle & Carlisle Railway in 1862. This had built the first railway across the Pennines in 1838. Despite being in a very profitable position, the NER did not rest on its laurels. A year later, it received authorisation to build a line extending the main line from York to join the Great Northern Railway at Doncaster. This completed the East Coast Main Line connecting London Kings Cross to Edinburgh Waverley. This required a new station at York. When it opened in 1877, it would be the largest station in the World with 13 platforms. Urban passenger traffic was also important for the NER. Seeing potential competition from new trams in the Newcastle area, the NER pioneered electrification with the Tyneside Electrification project. The first section was opened on 29th March 1904 and was almost the first mainline electrication project to open in Britain, but was pipped to the post by the Lancashire & Yorkshire who opened their system one week earlier. As a part of this scheme, the Newcastle Quayside Branch was also electrified. This was a short but tortuous line connecting quays in Newcastle with the (higher level) yards. The line featured tight curves, three tunnels, and gradients of about 1:30. After electrification, the Quayside Branch was operated by two Bo-Bo (LNER ES1) locomotives which would continue until withdrawal in 1964. The success of this electrification scheme led to the electrification of the Newport to Shildon main line in 1915. This was the first all-freight line to be electrified, and was operated by larger Bo-Bo (LNER EF1) locomotives. Unfortunately this came just as British coal production peaked. A combination of World War 1, falling coal demand, and economic recession meant these locomotives were never used to full capacity. With Grouping on the horizon in 1923, the Hull & Barnsley Railway (H&BR) voluntarily merged with the NER on 1st January 1922. The H&BR opened in 1885 in a desire by the merchants and city fathers of Hull to break the NER's monopoly on all railway traffic to Hull. Relations between the H&BR and the NER were initially very hostile but mellowed over time. By about 1920, their relationship was so friendly that merger was inevitable. 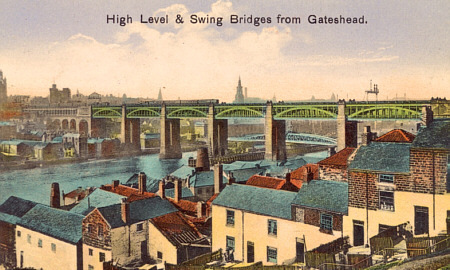 Thank you to Malcolm Peirson for the above pictures of the Newcastle bridges, the Berwick Royal Border Bridge, and the Newcastle Map (courtesy Gateshead Library).